Legends spread far and wide among the Klo-pas and gTingpas in the southeast part of Tibet that all Tibetan peoples descended from the same mother since the creation of the world. Actually, forefathers of these nationalities–the Zang (Tibetan), the Monpas, the Klo-pas, the gTingpas and the Sharpas — were the earliest pioneers of the Tibetan plateau. Later, the Mongolian, the Han and the Hui nationalities joined in and set up a very close relationship with them. But, owing to the most inaccessible living conditions to the outside, they have developed a series of colourful customs and rituals quite distinct from those of other people. The most conspicuous feature of all the customs is their different ways of dressing. 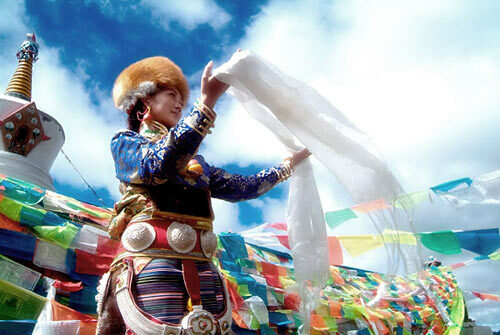 In Lhasa, you can see the typical Zhang clothes. Men wear collarless gowns with a long sleeve to match on the right shoulder, and women wear long-sleeves dresses gracefully with rainbow-like “pang-gdan” (apron). And you can also see, in the street of Lhasa, women of Gongpo and Dapu wear sleeveless jackets trimmed with golden corner decorations and long waistcoats with opens down the front gaily coloured striped woolens on either side, and with caps hemmed around with golden lace. The standard wear for Klopas and gTingpas, near to the dress of YunNan’s south westerner’s is a half-sleeved blouse made of black gunny with buttons down the front and a skirt that cover the knees. Hopa men wear short pullover waistcoats and always carry with them a saber and bow and arrows as symbols of masculinity.